The Tallahassee luxury home market has not cooled off one bit, surging ahead as buyers take advantage of near record low mortgage interest rates. Of the 74 people who have purchased a home for $500,000 or more this year, 20 paid cash (27%), which means that 73% are relying on the historic low interest rates to afford such a pricey home. Over the past 12 years, the cash paying subset of this group has been 15%, meaning 85% relied on low mortgage interest rates. Can you imagine the impact on the Tallahassee luxury home market when mortgage interest rates return to normal? 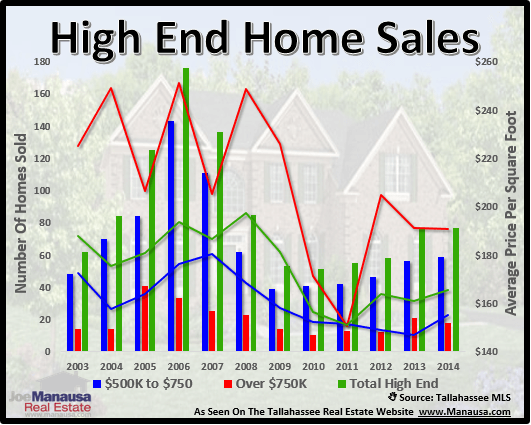 When we look at the upper end of the Tallahassee housing market, it is clear that we are still enjoying good times. Unlike many of the lower price ranges where sales remain at levels last seen in the early 1990s, high end home sales are doing quite well. The real estate graph below tracks home sales trends for homes priced above $500,000. In the graph above, the blue vertical bars show the number of closed home sales for homes priced between $500,000 and $750,000 each year, while the red vertical bars show the number of closed home sales priced above $750,000. The combined total of these two price ranges (closed home sales priced above $500,000) is shown in green. All three of these are measured on the left vertical axis. The corresponding lines show the average value each year for the same price ranges, and measured on the right vertical axis. Through October, there have been exactly the same number of luxury home sales in Tallahassee as there were all year last year (green bar), and the average value is on the rise. It is interesting to note that the average value of homes over $750,000 has fallen slightly this year, while those between $500K and $750K are up nicely. When we look at luxury home sales based purely on home size, we find a strengthening market. The average value of existing homes larger than 3,000 square feet has risen by more than 10% in 2014 versus 2013, but unit sales look to be about the same (with two more months to go, it looks like a dead heat). The following list shows ten of the luxury homes for sale in Tallahassee. You can see them all by clicking the link to the luxury home market, or get more details on any specific listing by clicking on the image of the home in question. 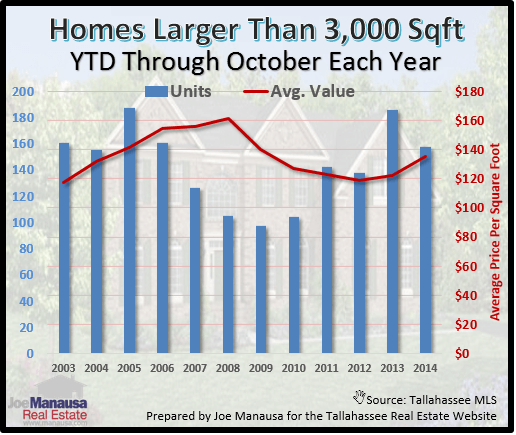 I hope you enjoyed our October 2014 update on luxury home sales in Tallahassee, please feel free to drop me a note if you have questions not covered in this report.